CWHL All-Star Game features many top players; one women’s league would unite all of them. The fourth edition of the Canadian Women’s Hockey League All-Star Game played on January 20 was an offensive barrage of goals exchanged among 34 of the world’s best female hockey players. In what might have easily been confused visually as a throwback to the Los Angeles Kings “Triple Crown” jersey days, Team Gold doubled up on Team Purple by a score of 8-4. The squads were captained respectively by goaltender Liz Knox of the Markham Thunder and Brigette Lacquette of the Calgary Inferno. Brianne Jenner was the heroine for the winning team. An Olympic gold medallist with Team Canada in Sochi in 2014, Jenner registered a hat trick, highlighted by a fantastic shorthanded breakaway goal that was culminated with a forehand deke of goaltender Emerance Maschmeyer. Jenner’s hat trick came on the heels of a two-goal outburst by her Inferno teammate and American rival Brianna Decker, herself a 2018 Olympic gold medallist. By scoring the opening goal of the game, Decker earned a crisp one hundred-dollar bill from guest coach, retired NHL goalie Glenn Healy, who offered the bounty to whoever netted the icebreaker. Meanwhile Knox and her goaltender teammate Noora Raty executed a rare “on the fly” netminder swap, to the delight of the fans at Toronto’s Scotiabank Arena, a modest crowd of about 5,000 aficionados, many of whom were players on minor girls’ teams along with their coaches and parents. Indeed the game was a showcase of top-notch talent, including Olympians from Canada, the United States, and – in the case of Raty – Finland. How much more exciting would not only the All-Star Game, but the world’s best women’s league, be if all the world’s elite players skated under the same umbrella? Among the notable names not present for the event were U.S. star forward Amanda Kessel and standout Canadian goaltender Shannon Szabados. That’s because they, along with several high-caliber players, hone their craft in a different league, the National Women’s Hockey League, which operates exclusively south of the border. Beginning with the NWHL’s inception in April 2015, the U.S.-based organization and the CWHL have operated under vastly different models, the former being a profit-based organization and the latter having been non-for-profit since its foundation, eight years earlier. The opposing philosophies have been an obstacle to bringing the best players together, in a tug-of-war analogous to the NHL vs WHA discourse of the 1970s. A merger between the CWHL and NWHL would undoubtedly strengthen the women’s game. The social media hashtag #OneLeague gained momentum in March 2018 as the league’s respective championships, the Clarkson Cup and Isobel Cup were being decided. Long before taking her current role as Interim CWHL commissioner, Jayna Hefford has shared the vision for a unified league, although not necessarily a mere fusion of the two leagues into Canadian and American divisions, which would come with a risk of diluting the talent pool as opposed to employing the best available talent, on a global level. “There needs to be one league, four to six teams, and you’ve got to get the best players in the world; the best Finnish players, the best Swedish players, the best Russian players,” Hefford said in 2016. Upon taking the CWHL’s top job in July 2018, Hefford reiterated her vision for a single professional league, with the NHL as a potential partner. “How soon that can happen, I don’t know if that’s a one-year thing, a two-year thing. I just want to see the sport at a place where I think the athletes deserve it to be. The players have the power. If they want to be in the same league, then we’ve got to find a way to make that work,” she told the Canadian Press. 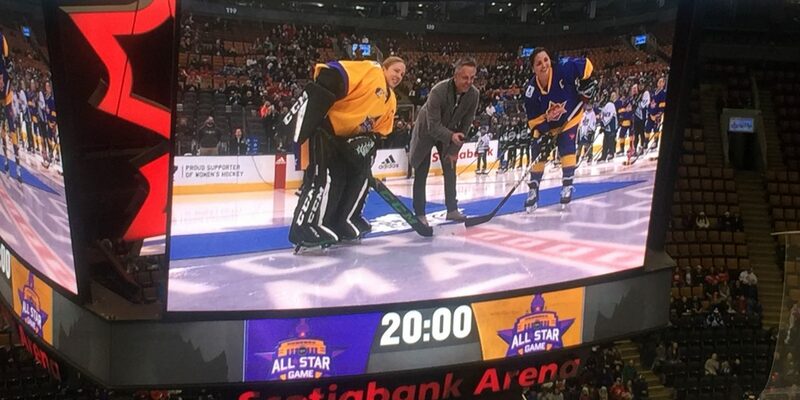 With NHL alumni such as Healy, Curtis Joseph and Hall of Famer Doug Gilmour serving as guest coaches in Sunday’s affair, it’s no secret that the women’s game has garnered a tremendous amount of support. The next logical step is to merge the two existing entities so that players of the caliber of Kessel and Szabados can join their international teammates, the likes of Hilary Knight and Marie-Philip Poulin, in continuing to grow the game, harmoniously as opposed to separately. While US Olympians Kendall Coyne-Schofield and Brianna Decker were making headlines at the NHL All-Star Game in San Jose last weekend, their linemate on the national team Hilary Knight was suiting up for the Montreal Canadiennes, splitting a weekend series with the Markham Thunder. In between her team’s games, a 2-1 loss Saturday, followed by a 6-2 win Sunday, Knight had been celebrating remotely with Coyne-Schofield, the seventh-fastest skater at the skills challenge in San Jose. “I think a lot of the times, the naysayers are saying that women aren’t as fast as men, and that was a perfect example of how we are just as fast as the men, and we can compete on the same level,” Knight said. Knight of course was no stranger to the NHL event, having participated as a demonstrator of the shooting accuracy competition last year in Tampa Bay. “I was kind of bummed that my event was a demo because I would have crushed the guys,” she said. In Sunday’s outing, Montreal’s Jillian Saulnier had a career-best four-goal outing to help lead her team to victory.